In a Landscape ( Digital print on Wood 2014) is a collaboration project between artist and stage director Martin Butler and digital painter Floris Didden. Inspired by early 19th century theatre design, Floris created a three dimensional digital painting allowing you to enter into a fairy realm. Using the classical stage principles of Trompe-l’œil, and forced perspective, the viewer is able to peer into and enter this representation of a world between worlds. 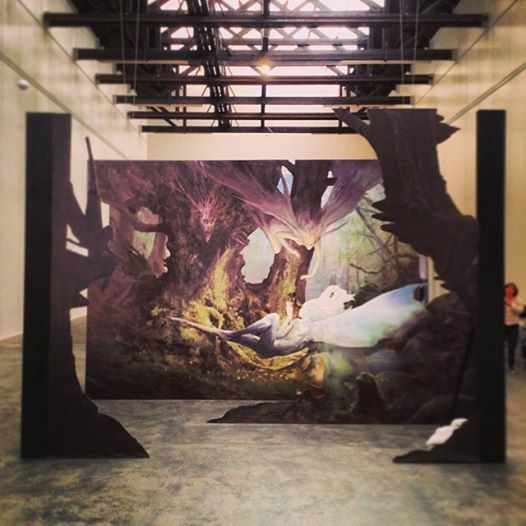 The piece was originally commissioned for the Mediamatic lightness exhibition ” Fays, Fairies and Other Magical Creatures”. From the 26th June to the 24th August at the De Oude Kerk, Amsterdam as part of Salon/ Big Bang the exhibtion attracted over 20,000 visitors.